Half a century ago on a crisp, clear November Sunday in 1963, two antiquated and diminutive black tank locomotives hurried their train of green passenger coaches, over the creaking timber bridge across Langstone Harbour. Much as they had done many times before on their way between Hayling Island and Havant. On reaching their destination however, they brought to a close almost a century of railway history in southern Hampshire, as the ‘Hayling Billy Line’ as it was affectionately known locally closed finally and forever. Despite attempts by preservationists to save it for posterity in the style of the already thriving Tal-y-lyn and Bluebell railways, not much remains today of this much loved and sadly missed byway. In the 21st century only the concrete pillars which supported the bridge timbers remain in mute testimony to that ‘last train’, along with so many before them carrying happy holidaymakers to the Hayling seaside, as well as local islanders going about their daily business in peace and in war. Elsewhere part of Hayling Island station is now lovingly restored to become a successful local theatre. The trackbed itself, long devoid of rails and sleepers, is now put to good use as a popular footpath, cycleway and nature walk known appropriately as the ‘Hayling Billy Trail’. While of the line’s famous Victorian ‘Terrier’ locomotives, the only ones light enough to cross the bridge to Hayling, no fewer than ten have survived to the present day, in locations as diverse as the Isle of Wight, Kent and Canada. 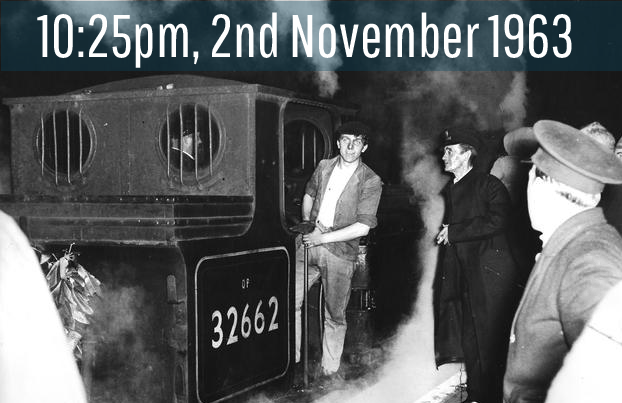 One of the aims of this website is to work with railway enthusiasts, environmentalists and local community groups to ensure that throughout 2015 the 150th anniversary of the beginning of freight rail to the island, is suitably commemorated. To achieve this by putting together a series of activities to serve as a nostalgic reminder of times past for those old enough to remember those far off days, while acting as a valuable education to those for whom such wonderful times are but a faded old photo in a history book or family album. We hope you enjoy exploring the following pages and links, and join with us to remember and celebrate the memory of the old ‘Hayling Billy’. To understand why a railway to Hayling was ever considered when the Island was rural with a small population, it is necessary to understand a little about the transport links in the area and the lessons learnt from the Napoleonic war that ended in 1815 with the Battle of Waterloo. Britain was a great trading nation with merchant ships arriving at the Port of London where goods were received for internal use or transhipment to other parts of the world. Passage through the narrow English Channel was hazardous from attack by enemy ships and the sandbanks in the Thames Estuary was a natural hazard. Both these factors caused the loss of many ships and sailors. The road system, at the time, was unsuitable for moving large volumes and heavy traffic between London and other parts of the kingdom and instead, the canal system and early developing railways routes were used for this purpose. Portsmouth naval base and the surrounding area could only be supplied by sea because neither a canal nor railway route existed until the latter part of this period. This section deals with the development of the Portsmouth – Arundel Canal which attempted to address this issue. It also deals with the first fixed link to Hayling Island resulting from the cutting of the ‘wadeway’ in the construction of the canal. Another important and relevant factor was the sale of Hayling Manor and the title that was part of this heritage. This resulted in the drive to make changes on the island for commercial reasons. The Portsmouth – Arundel canal ceased to be navigable from Portsmouth to Chichester by 1847. In the same year, the London, Brighton and South Coast Railway (LBSCR) completed a connection with Portsmouth via Havant and thus provided an alternative inland route to London and other parts of the kingdom. The arrival the railway at Havant encouraged the local businessmen to build a horse drawn tramway between Havant and Langstone Wharf for the transportation of goods which, although authorised, was not completed. None of the schemes implemented thus far addressed the issue of reducing the need for merchant ships to travel to the Port of London via the narrow english channel. A paper in the Naval Chronicle of 1855 proposed creating a Merchant Port in Langstone Harbour and it to be a satellite to the Port of London. The new Port was to be constructed near to the Hayling – Portsmouth ferry on Hayling Island. It was to be connected with the railway network. Bonding warehouses were to be built at Langstone Wharf to handle goods for transhipment elsewhere. There were fears about another war with France in this period leading to the building of fortifications protecting Portsmouth Naval Base enemy attack from Portsdown Hill. The proposal in the Naval Chronicle formed the basis of the first of the Acts of Parliament authorising the construction of the Hayling Branch line. The Docks part of the proposal was expected to become part of another Parliamentary Bill which was never completed. The struggles with the construction leading almost to the abandonment of the scheme which required courage and a complete change of direction are recorded. This section maps the history of the branch line throughout its operational life. The Hayling Railway Company contracted Fredrick Furniss to run the train services between 1867 – 1872. Neither of the main line railway companies (LBSCR & LSWR) being interested in the Hayling branch line. The location of the engine shed. 1868 Railway timetable and prices. Use of a single locomotive to run the branch left the Hayling Railway Company vulnerable to maintaining a service. Negotiations with the London Brighton & South Coast Railway (LBSCR) resulted in an arrangement whereby the LBSCR ran the branch on behalf of the Hayling Railway Company, providing the staff and stock to do so. Ownership of the branch line remained with the Hayling Railway Company with a lease being granted to the LBSCR. Locomotives, Rolling Stock & Engine Sheds. The description in this section awaits completion of the data transfer from the HB50 website. The period when the Hayling Island branch Line was in operation. This approach is designed to answer why a branch line to Hayling was built, the struggles in building the branch line and the changes that took place in the life of the railway since 1865.